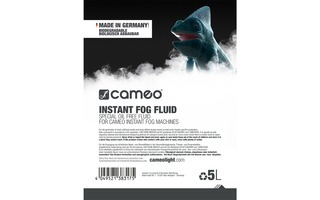 High density fog with excellent reflective properties and medium hang time - the water-based Cameo INSTANT Fog Fluid is specially formulated for Cameo INSTANT Fog Machines. Perfect for discotheques, theatres, events, filming and lighting enhancement, it is ready to use, odourless and oil-less. 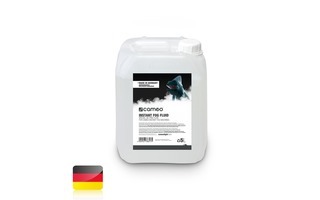 INSTANT Fog juice is made in Germany under continuous quality control with water that has been distilled 10 times to prevent residue. It is biodegradable, non-toxic and comes in a reusable container. A certificate of compliance and DIN safety data sheet are available for download. ¿Ha visto Cameo Instant Fog Fluid 5 L más barato?